The van continued to Borough Market, a popular area for evening drinking and dining. There, three attackers got out and began stabbing passers-by. Armed police were called to the scene and shot three men dead. According to police, armed officers fired as many as 50 bullets in order to neutralise the knife-wielding attackers. Photos of the bodies appeared to show canisters strapped onto their clothing but police later revealed these were hoax devices. British authorities said the fake bomb vests were designed to sow additional panic and fear among the public. The attack was over eight minutes after the alarm had first been raised. 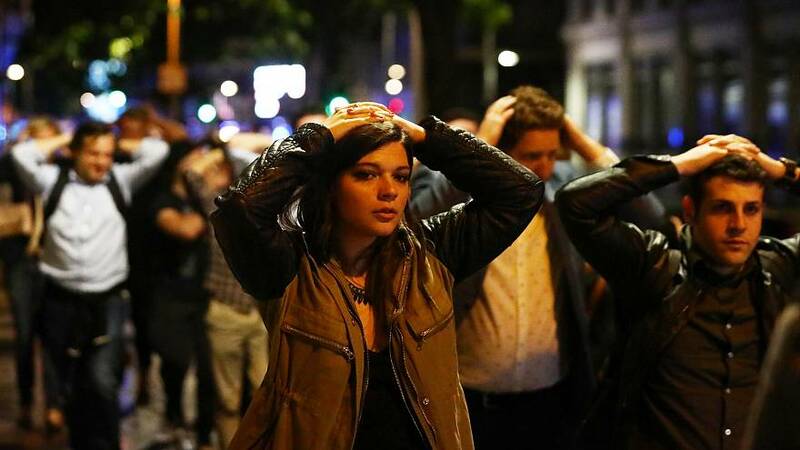 Twelve people were arrested by the Metropolitan Police Sunday in connection with the attack. Searches continued early Monday morning with police raiding two more addresses, one in Newham and the other in Barking. Both neighbourhoods are in east London where police have focused their investigation. Officers from the Metropolitan Police’s Counter Terrorism Command said “a number of people” were detained in the Monday raids, but did not elaborate further. As many as 36 people are being treated in five London hospitals. Twenty-one face serious injuries and are in critical condition, said UK health officials at the National Health Service. A Canadian national is among the known victims of Saturday’s attack which killed seven and injured 48 others. Christine Archibald was from Castlegar, British Columbia. Her family confirmed her death in a statement. Foreign Minister Jean-Yves Le Drian confirmed to French media a French national is also among those killed in the attack. He added seven are in hospital, four of them with serious injuries and that one French national was still missing. A British Transport Police officer and an off-duty Metropolitan Police officer are among the 48 people injured overall. London’s chief of police said Monday it appears as if the UK is facing a terror threat that is largely domestic in nature but that has foreign dimensions. He added he does not think London police should be routinely armed. London mayor Sadiq Khan described the incident as a “deliberate and cowardly attack on innocent Londoners and visitors to our city enjoying their Saturday night”. Prime Minister Theresa May returned to Downing Street overnight, and in a statement she vowed to fight the “evil ideology of Islamist extremism”, declaring “enough is enough. After temporarily suspending their general election campaigns over the weekend, Labour and the Conservative Party went back to work ahead of a general election vote still planned for June 8. Opposition Labour leader Jeremy Corbyn called the attack “brutal and shocking”. Tim Farron, leader of the Liberal Democrats party, said it was a “horrific incident” and Scotland’s First Minister Nicola Sturgeon described it as “dreadful news”. French president Emmanuel Macron and the US State Department were among the international voices of solidarity with London. The UK will observe a minute’s silence on Tuesday June 3.